Ever since attempting to grow our own vegetables with my young children I have been amazed by the decimation caused by caterpillars on crops. At the time my family were engaging in our first gardening experiments and initially we were all delighted to see the range of butterflies in the garden, clustering around a new vegetable patch; quite forgetting that these beautiful creatures lay eggs which hatch into some incredible looking and very hungry caterpillars, (not to mention the caterpillars from our nocturnal visitors, the moths); and unlike Eric Carle’s ‘The Very Hungry Caterpillar’, there wasn’t just one, there was an army of them, who had in a very short time completely destroyed our little crop. It was one of life’s steeper learning curves! Thankfully neither our livelihood or our next meal was dependent on the success of our vegetable crop, but seeing the speed and extent of the destruction caused by these caterpillars made me realise the very real problem that these creatures can cause farmers, whose livelihood does depend on the success of their crops. Without adequate pest control measures farmers can face either crop destruction, or tough decisions regarding the application of pesticides to their crops. In our family instance our total crop (admittedly only around 10 Brassicas) was wiped out by the caterpillars, but not all pest infestations will have such a dramatic effect. In some instances plants can tolerate small “injuries” (physical harm by a pest) but no “damage” (monetary value lost as a result of pest injury, such as spoilage, or yield reduction etc), or will channel more energy into growth or fruiting. Therefore the effects of some pest populations may not cause enough of a loss to justify the time or expense of pest control operations. So the question is, at what point do farmers decide to employ some form of pest control measures? Entomologists refer to a break-even point, or economic injury level (EIL) where the pest populations density is at a level where the cost to control it equals the amount of damage it inflicts. The EIL is usually expressed as the number of insects per unit area, or sampling unit. Often, due to the lag time in the implementation of a pest control strategy and its effects, pest control measures need to be put into place before a pest population reaches outbreak status: this moment is below the EIL and called the economic threshold. The economic threshold is the decision point for action to ensure the pest population does not reach the EIL. Recent research carried out by Dr Rogers and Dr Brier at the Queensland Department of Primary Industries and Fisheries, in Australia, has looked at the effect of the cotton bollworm (Helicoverpa armigera) on soybean and dry bean. The cotton bollworm is a major pest on both crops in Australia, Asia, India and Africa. However there are limited details on the EIL’s or economic thresholds for these plants. 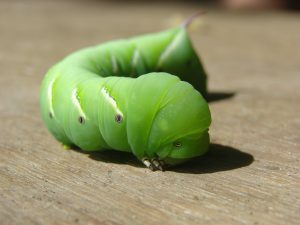 In the past, attempts to develop economic thresholds have used artificial defoliation or depodding techniques which may not accurately simulate the effect of the caterpillars’ eating, and hence lead to inaccurate results for EILs. This latest research has shown that the cotton bollworm does more than just eat the leaves; it eats the leaf veins, petioles, apical growing points and hence limits the plant’s ability to compensate for the damage caused by the caterpillar: this means that previous estimates for the economic threshold from research using artificial defoliation and depodding are artificially higher. Two papers were published in Crop Protection 29, detailing studies on pest damage relationships for the cotton bollworm on vegetative state (Crop Protection 20, 39-46) and on soybean and dry bean during pod fill (Crop Protection 29, 47-57). The experiments were carried out at the Queensland DPI research station at Kingaroy, Queensland over 3 years. The collected data were analysed in Genstat using regression analysis; simple linear, multiple or split-line regressions were fitted depending on the relationship and data available. The results of the studies have highlighted discrepancies with other studies where artificial defoliation has been used to mimic the behaviour of the caterpillar; the yield loss figures from Rogers’ and Brier’s studies are considerably lower than previous studies suggesting that the yield loss figures from previous studies are misleading. These studies have provided farmers with more accurate details on the effect of these caterpillars on soybean yield meaning more effective pest control measures can be employed. Our thanks to Dr Rogers for his help in this piece. Dr Rogers provides pesticide-efficacy data analysis services to the crop-protection industry and also assists authors with the preparation and submission of scientific publications.